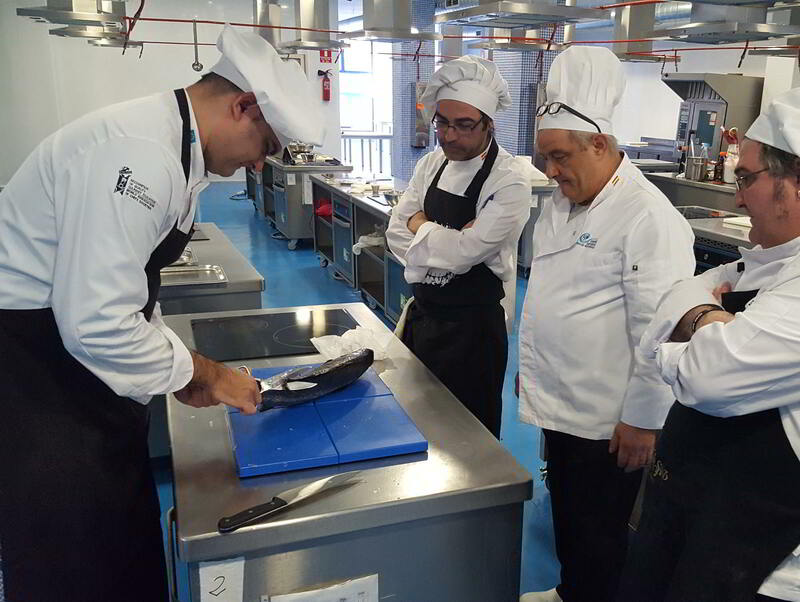 Frescamar has signed an agreement with the educational center Centro Superior de Hostelería del Mediterráneo (CSHM) with the aim to familiarize future stove masters with its leading product, Corvina REX Frescamar. Corvina is a traditional species from our coastlines that Frescamar has recovered through Aquaculture strengthening all its goodness. Apart from its unique texture and taste its versatility in the kitchen is remarkable. The first event to take place after the signature of the mentioned cooperation agreement was Corvina REX involvement in the Center Gastronomic Workshops with an interesting company and product presentation in front of a really focused audience formed by students and teachers. The speech reached its highest peak with a demo of different cutting options and tips to obtain the maximum yield of each single piece. Students were able to apply the acquired knowledge after the workshops thanks to the Corvina REX Frescamar supplied by the company. They gave free rein to their creativity manipulating and cooking this delicacy. Centro Superior de Hostelería del Mediterráneo started in 1994 when a group of entrepreneurs from the Catering and Tourism sector created a school with the intention to improve their competitiveness through their worker’s qualification. Currently the center is member of the World Association of Chefs Societies and focusses on the education, training and development of the culinary and gastronomic sector with the goal to become a worldwide referral on its scope.